Gold has continued to be one of the most prestigious ways of investing in precious metals because of its extensive history. 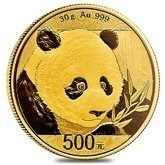 Physical, solid gold like a gold coin or gold quarter is known as an excellent means for trading operations due to its scarcity, and inherent value. Similar to silver, gold is one of the very few precious metals to stand the test of time as a proven and trustworthy savings investment strategy. 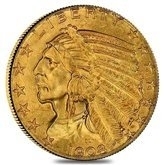 For many years, gold coin and bar bullion items were considered to be a symbol of wealth and luxury. To buy gold bullion options like a gold bar, gold quarter and gold coin were preferred for hundreds of years by many powerful civilizations and nations. For this reason, we buy gold to protect against inflation and to own state-of-the-art pieces of the world’s most famous producers. Learn more about investing in gold and which gold products to buy from our Learning Center. Gold bars and gold coin are manufactured by several renowned precious metals mints and refineries all over the world. Gold bars are typically preferred by investors that are looking to increase their portfolio with highly valuable gold bullion. While, a gold coin is the preferred collectible of numismatists and coin enthusiasts. The historical value and in some cases, scarcity cause gold coins to usually carry a higher premium over the gold spot price over gold bars. However, they can be an exclusive and extremely rare addition to your collection. Discover which gold products carry the lowest premiums and what the top best gold items (coins and bars) of this year are from our Blog. One of the safest and most cost-effective ways to buy gold bullion is by investing in gold bars. Bullion bars can be easily stored and traded which makes for a popular investment choice. 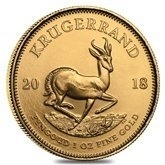 Offering the purest gold content, the purity of gold bars are often even higher than that of the finest gold coins available (such as American Gold Eagles, South African Krugerrands and Pre-1933 Gold Coins) on the gold market. Since gold bars carry a low premium, they are often only slightly higher than the gold spot price. 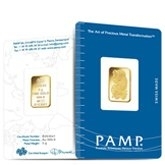 Popular private mints like PAMP Suisse, Credit Suisse, Republic Metals Corporation (RMC), and other manufacturers stamp the weight and purity of the gold as well as its unique serial number for enhancing its security. Gold bullion bars can be purchased in different sizes from 1 kilo down to ½ gram options. 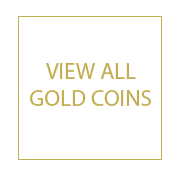 Browse our extensive collection of Gold Bars here at Bullion Exchanges! 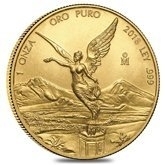 For generations now, gold coin and gold quarter has been purchased for both investment and collection purposes due to their unique design, rarity, and high demand. 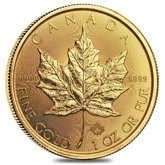 Trusted mints all around the world including the United States Mint, Perth Mint, Royal Canadian Mint and many more produce gold bullion coins of the highest quality annually. 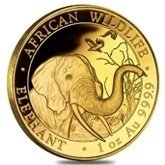 The gold bullion coin market offers a vast array of sizes, shapes, weights, and designs. 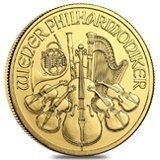 Investors and collectors commonly purchase 1 oz gold coins. However, the sizes range from 1/50 oz. to 1-kilo gold coins. The design and style of gold coins can also range from being round, scallop, rectangular or colored, with exclusive and iconic designs. 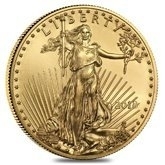 Browse our extensive collection of Gold Coin here at Bullion Exchanges! 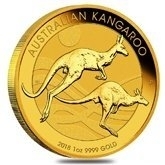 Gold bullion struck by many renowned government mints and private mints, as well as companies that refine different precious metals and produce bullion products in several forms can be purchased. Government mints are operated by sovereign nations that produce coins with legal tender for circulation. 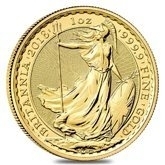 However, some government mints also produce other gold bullion products that are meant to be part of collections and aren’t made for circulation but rather for collection purposes. Private Mints are operated independently from country governments. Since these products are created by private mints, they cannot product products with legal tender and therefore only produce bars and rounds, not coins. A legal tender assigned to coins, making them significantly distinct from rounds. 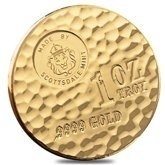 Each mint uses special and unique techniques to design and produce wide assortments of gold products. Gold bullion has always been an ideal way to hedge against inflation and the national currency’s weakness. Compared to silver, gold has maintained its role as a legal tender in many countries by always being in high demand, well-analyzed and very appreciated by perspicacious investors and collectors. Gold has proved its stability during many historical financial crises and significant events. It has ensured its position as a reliable means of preserving wealth. Having physical gold assets has been a well-known strategy for various wealthy nations, civilizations and generations. Additionally, if you purchase gold bullion, you can choose to utilize it as a retirement option by adding it to your Precious Metals IRA Account. Therefore, whether you are buying physical gold as an investment opportunity, a way to protect your savings or as an exclusive addition to your collectible portfolio, gold will always be a proven and prominent precious metal.